Cafe Marmot is a hard place to get to in a hurry. Apart from being perched atop the 2,400m summit of Mt Besson, the three-feet-thick snowdrift which has settled between the piste and the entrance has made it inaccessible to anyone but the hardiest (or hungriest) of skiers. Somewhere out there the views, we are told, are beautiful. But the snowfall, which has continued for the three days of our trip, has blanked out the opposing valley. The stunning backdrop could look like Stevenage and we would never know the difference. Yet if the heaviest snowfall in decades means an enforced break from the outside world, it seems to be a price worth paying as the conditions are beyond perfect. Trucks have even had to be brought in to take excess snow away and the avalanche warnings are out in force – yet the Grappa, which has been served out liberally amongst the table, suggests that even if we are snowed in for the rest of the day, the entertainment is sure to continue well into the night. 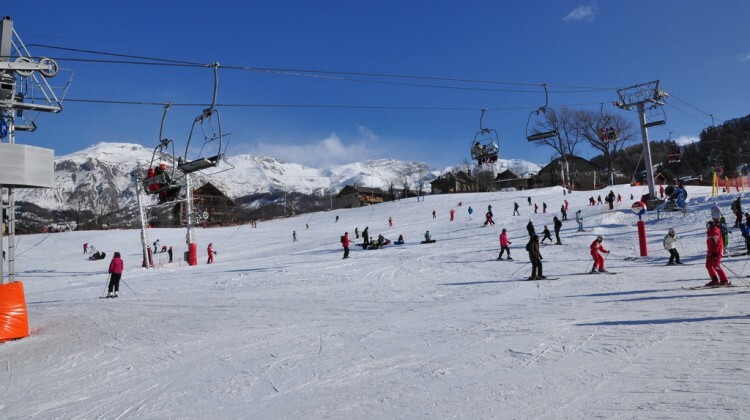 As host of the freestyle skiing event in the 2006 Winter Olympics and one of the hubs of Italian skiing, Sauze d’Oulx should be one of the more famous European snow destinations. But apart from the groups of young, boisterous men who help to give it the reputation as the hard-drinking capital of the Italian Alps, it is not particularly well known in the UK. Since it’s recent heyday in 2006, it has been passed over as tourists flock to the more popular but ever crowded resorts of Meribel, Val d’Isere and Chamonix. This is a shame as the town has historically been a favourite vacation spot for Turin’s aristocracy. The patronage of Italy’s finest families has left its mark on Sauze, which can boast a range of fine restaurants within the old town and good quality local wines which can trace their roots to Roman vineyards in the area. While the apartment blocks and hotels cope with the yearly influx of skiers and snowboarders which swell the population from a mere 650 to over 27,000, the old medieval town manages to remain astutely aloof from the racket and it is easy to follow the footprints down a side street and into the cavernous cellar of a local restaurant. For its size, the town is adept at catering for the influx of tourists. Hotel Sauze, where we stayed, was comfortable and while not the most luxurious of establishments in the town, it more than made up for this loss with excellent service and friendly staff. 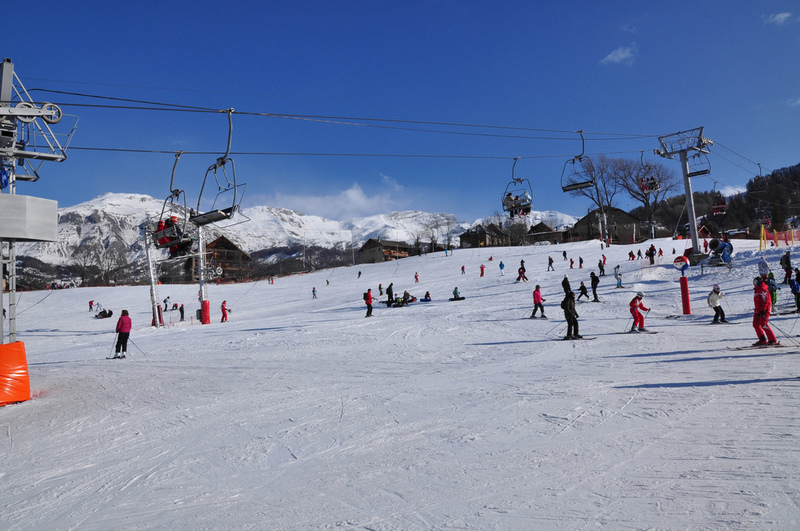 Of course, the real reason to visit is the skiing; the vast tracts of space on the slopes are stunning. With over 250 miles of runs careening in every direction and good links with the separate towns of Sansicario, Sestriere and Cesana which together form the Via Lattea (Milky Way) set of resorts, you quickly realise that the mixture of long black runs and off-piste slopes will keep all but the most ardent skier occupied. Beginners can hone their fledgling talent on any number of blue or green runs and special areas. I was visiting to learn the art of skiing myself and was joined by my accomplice Rob for a day’s tuition from instructor Nani from the Sauze Sportinia Ski School. Skiing can be one of the most frustrating sports in the world – even standing still you can fall over. The idea of balancing the alien movements in your lower body makes the thought of getting down a mountain positively terrifying and the nursery slopes are daunting enough. And yet, with a few hours of tuition we both found ourselves carefully picking our way down a blue run with enough time and space to nail the intricacies of turning, stopping and picking oneself out of a snowdrift to retrieve a pair of skis before heading back for a well-deserved après ski. Yet, even with the impromptu stops, on more than one occasion I finished a slope without seeing a single skier. And, avalanches aside, an hour didn’t go by without someone coming off the piste to declare that these were the ‘best conditions they had ever experienced’, while the snow cannons lay idle, relics half-buried in layers of ‘neve fresca’ (powder snow). All I needed was proof but in my own mind my suspicions had already been confirmed: Sauze is the secret skiing spot Italians would rather you didn’t know about.